Felons and domestic abusers can no longer buy guns with no questions asked. What is the Oregon Firearms Safety Act? Do all gun transfers require background checks? Are family members exempt from background checks? Criminals will get guns anyway. Why make gun buying more difficult for lawful gun owners? Can I give a gun to my grandchild without doing a background check first? Do I need to do a background check on a friend if I lend her a gun when we are hunting? Where can I find a federally licensed firearms dealer? How much will a background check cost? What happens if my background check is not completed in three business days? OFSA closes the private sale loophole and helps stop criminals from buying guns. OFSA, an extended background checks law, which is supported by 87% of Oregonians, requires background checks for private gun sales. Until OFSA took effect, background checks for gun sales were only required from a federally licensed firearms dealer or at a gun show. An estimated 40,000 to 75,000 guns were sold annually in Oregon without a background check through private sellers. Previously, felons, domestic violence abusers and others who are prohibited from buying guns could buy guns through a private sale with no questions asked. OFSA closed a gaping hole in Oregon’s background check system. Additionally, OFSA helps to reduce gun violence by authorizing judges to rule if people ordered to undergo outpatient treatment for mental health illnesses should be prohibited from purchasing or possessing guns during treatment. Felons, domestic abusers, and the dangerously mentally ill can avoid the background check system by going to private sellers, no questions asked. Requires all private transferors of firearms to appear at gun dealer in person with both transferee and firearm and request criminal background check before transfer. Enumerates exceptions for family members, law enforcement, inherited firearms and certain temporary transfers. States that violation of background check law constitutes Class A misdemeanor for first offense and Class B felony for second and subsequent offenses. Provides that if transferor and transferee live over 40 miles from each other, transferor may ship or deliver firearm to gun dealer located near transferee. Allows Department of State Police to notify local law enforcement when background check demonstrates transferee is prohibited from possession of firearm. Allows court to prohibit person participating in outpatient treatment from possession of firearm during period of treatment upon certain findings. Temporary transfers that occur exclusively while in the presence of the owner. Oregon law prohibits the sale or transfer of a gun to someone you know or should know is prohibited by law from purchasing or possessing a gun. Yes! Background checks are simple and effective. During 2013 alone, Oregon’s background check system prevented 2,215 prohibited persons from purchasing guns from licensed dealers and at gun shows (Oregon State Police data). Background check laws make women safer: There are 46 percent fewer intimate partner gun homicides of women in states that require background checks for private handgun sales than in states that do not. Everytown compared the number of women killed with guns by current or former male partners (husband, ex-husband, common-law husband, or boyfriend) over a five-year period (2008-12) in states that did or did not require background checks for unlicensed, “private” handgun sales. Data were obtained from the FBI’s Supplementary Homicide Reports (SHR). Background check laws make law enforcement officers safer:There were 48 percent fewer law enforcement officers killed with handguns that were not their own in states that require background checks for all handgun sales than in states that do not. During the study period, 13 states required all gun buyers to undergo a background check before buying a handgun in an unlicensed sale, and 36 states did not. Between 2000-11, the FBI reported that 676 law enforcement officers were killed in action in these states, of whom 551 (82 percent) were killed with firearms, and 347 were killed with handguns that were not the officers’ own. Adjusting for population, there were 48 percent fewer law enforcement officers killed with handguns that were not their own in states that require background checks for all handgun sales than in states that do not. Please refer to this updated study for data on this research. Please note that Missouri’s background check law is referred to as “permit-to-purchase” or PTP. 83% of gun owners in Oregon support background checks. The vast majority of gun owners are responsible owners and sellers who do not want to arm criminals. They understand the need for background checks and are willing to wait a few minutes before a gun purchase. They know that background checks save lives. For the purpose of preventing imminent death or serious physical injury, and the provision lasts only as long as is necessary to prevent the death or serious physical injury. The Oregon State Police charges $10 for a background check. OFSA says an FFL dealer may charge a “reasonable” fee for the check. Charges vary with the dealer. While more than 90% of firearm background checks are completed in minutes, some take longer. If the time needed to complete a firearm background check takes longer than three business days, the gun dealer is permitted, but not required, to complete the gun sale. This is known as “The Charleston Loophole” because it is how alleged shooter Dylann Roof obtained the gun used in the Mother Emanuel AME Church in Charleston, South Carolina. 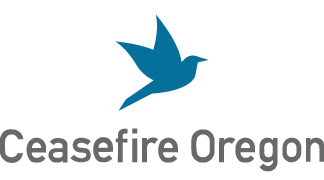 Ceasefire Oregon urges gun dealers to not complete a firearm sale until the background check has been completed.